There’s one thing Rita Ora, Rihanna and Bella Hadid have in common right now except from their beauty, talent and success. It is the so parisian and super cute beret - a head piece Vogue even prophesied to become „one of Fall 2017’s most ubiquitous items for gals and guys“. So not only stylish but unisex - I like! Whereas most beret’s come in classic colors like black and red, you can spot a huge variety of colors and patterns this season. But where does the beret even come from - apart from it’s obvious French roots? And how did it manage to never really get out of style throughout the decades of its existence? So let’s have a look at the whole story behind it, shall we? According to wikipedia a beret is „a soft, round, flat-crowned hat, usually of woven, hand-knitted wool, crocheted cotton, wool felt or acrylic fibre“. And has been worn throughout different social „classes“ and professions, such as the military, artists and even royalty at some point. It was some time during the 19th century that mass production of the basque-hat started and also when the military was first seen wearing berets. It’s definitely had it’s ups and downs through history - from being associated with the working classes to being part of every nobleman’s wardrobe but it’s always kind of made it’s way back around and has never really changed in looks. It’s just one of these classic pieces that always work. Now the question a lot of people are asking probably is: “It’s cute and all but how do I even wear that?“. I will admit I myself had to do some research first before wearing my beret publicly - I mean you don’t want to look like you tried and failed when you’re going all Parisian here, do you? Throughout my research on the world wide web I realized that there’s not really one single way of wearing it and unlike my previous thinking there seemingly aren’t any major fauxpas, no matter if you pull it up or down, wear it straight or to the side. It also just depends on the beret’s style, as some are a lot more stiff then others. But anyways it’s simply always très chic. But if you’re still not sure how to wear it you can always go on YouTube and check out some Frenchies talking about the different basque styles - you can never be “overeducated“, right? Haha. 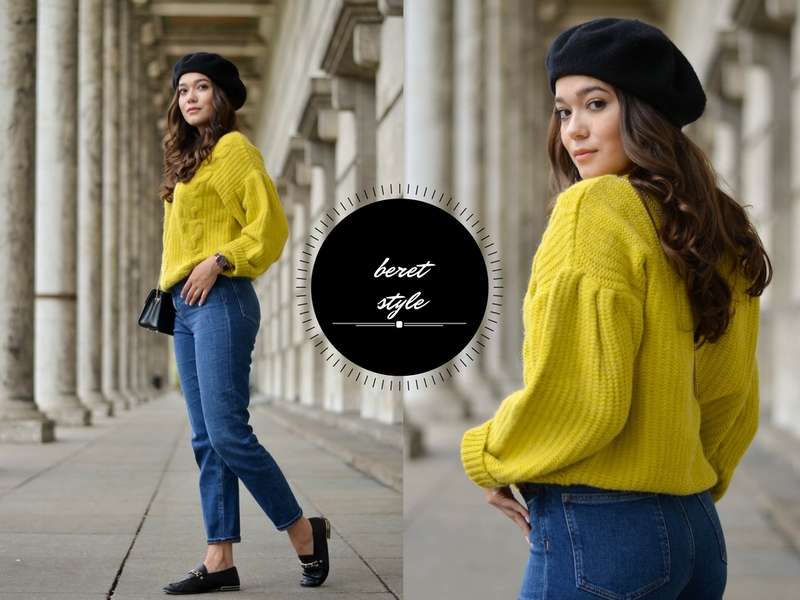 I decided to wear my beret with this super cosy yellow knitted sweater that I got on Asos. Black and yellow, black and yellow, black and yellow, … No kidding aside, I just love the combination of a bright sweater and the classic black beret. I am also wearing my beloved Karl Lagerfeld loafers with gold details and my new mom jeans. As always I linked all outfit details and some more inspiration for you below. 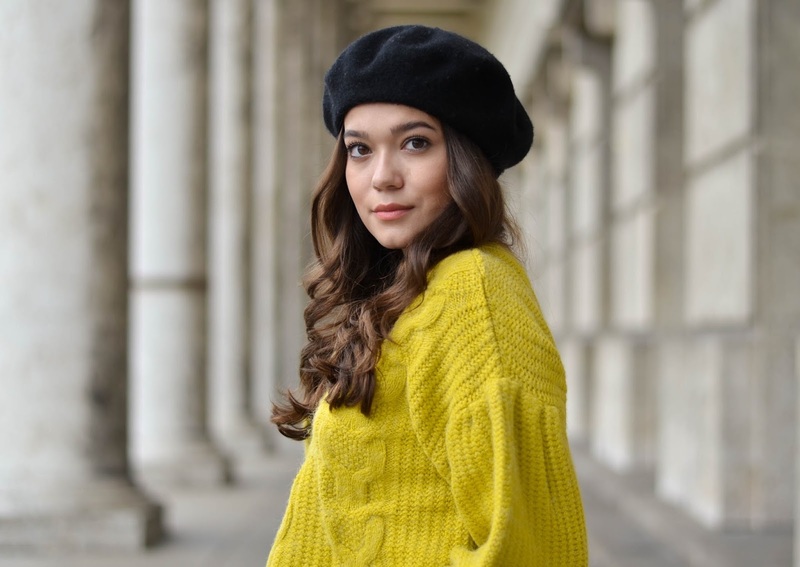 I think berets are a piece everyone can pull off, no matter if you’re a “hat person“ or not, as they come in so many different styles and colors but I’d love to know what you think of this hat trend? Do you like berets? If the news about this season’s ultimate it-color still haven’t reached you, you truly must be living under a rock, because it’s worn by everyone and seen everywhere lately. Yes, you guessed it, RED it is. And as if one red piece wasn’t enough of a color pop already, the new thing are RED ALL-OVER looks and I, I love them! How to wear the color RED? I think red is such a fabulous color which can be worn by pretty much anyone. Even if red all over is a bit too much for you, I’m sure you can at the very least pull off a red lip or red nails. It’s the color of passion, love and lust - if that doesn’t get you all excited and motivated I don’t know what will. 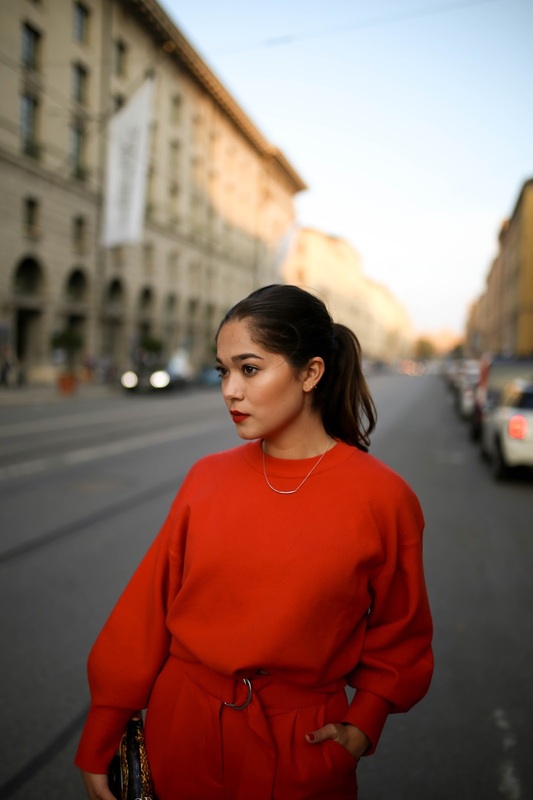 The easiest and most everyday-life-friendly option is a red shirt, blouse or sweater like the one I’m wearing, paired with jeans, black trousers or a simple skirt. This way you make a statement without being too „out there“. For those of you who want to try something new, red trousers or skirts are a great option as well; just imagine it the other way round: red bottoms, simple top (e.g. a black turtle neck, simple black or white shirt/sweater). And of course there’s lots of amazing accessories like scarves, bags and jewelry that can easily give your outfit that special something. 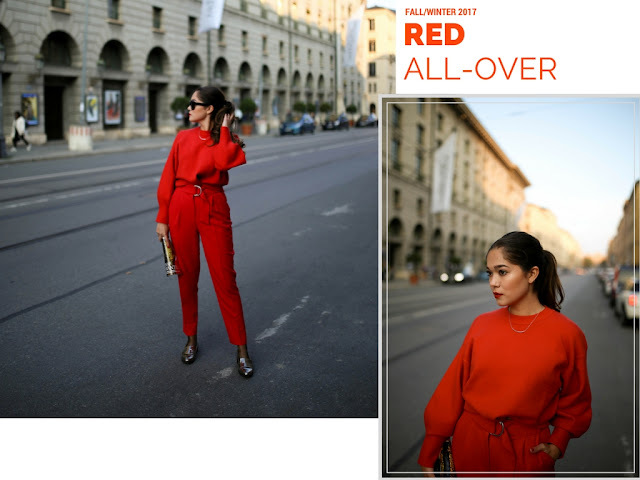 How to wear the RED ALL-OVER look? Now there might still be some of you intrigued by the idea of wearing a red all-over look but how do you best realize this idea? Of course it always depends on your personal taste but here I’d say there’s two ways to score with your red all-over outfit. You either go with the exact same shade of color, or you mix a classic red tone with a significantly darker shade of red. As for example in my outfit you can see, the sweater and pants are almost exactly the same color. That always works, not just with the color red. Although my accessories and the integrated belt give it a little bit of an edge as well. But now what to do if you’re not lucky enough to find a sweater matching your favorite red pants or the other way around? Another option is to mix of a dark red tone, like bordeaux with a classic red. This one’s of course the easier option because what could happen with option no. 1 is that you end up looking like you tried too hard if you don’t find pieces that hardly differ in color. If you mix two significantly different tones (and maybe even do some cool layering) people will know you actually intended on doing that and didn’t fail trying, if you know what I mean. When it comes to the shoes I personally decided to stick with the silver you can already see in my belt, just because red shoes on a pair of red pants and a red sweater would’ve simply been too much for me, but yet again it’s totally up to you and your very own taste. To help you out with finding your ideal red it-piece I (as always) linked some of my favorites for you to shop below. Let me know if you find any of these pieces interesting and what you think of the color red.